Energy-efficient and universal fit for added convenience. Hayward is always looking for ways to make pool and spa ownership as simple and effortless as possible. The latest example of this is the new Universal H-Series pool and spa heater. Combining advanced technology with universal-fit flexibility, it's a smart choice for virtually any new installation or existing system upgrade-delivering state-of-the-industry performance, outstanding energy efficiency, extremely low NOx emission levels and Hayward’s legendary durability and reliability. Offered in 150,000 200,000, 250,000,300,000,350,000 and 400,000 BTU/hr.inputs. Standard Cupro Nickel Heat Exchanger Totally Managed Flow provides exceptional corrosion resistance and erosion protection. Ideal for today's salt-based electronic chlorination systems. Superior Hydraulic Performance Industry-leading hydraulic performance saves energy by reducing circulation pump run time. State-of-the-Art Finn Plate Heat Exchanger with special V-groove design for faster heating and longer life. Insulated Fire Tile Combustion Chamber Unlike older forms of insulation, Fire Tile securely traps the heat, delivering the most performance from each BTU. Hot-Surface Silicon Nitride Ignition System Exclusive silicon nitride ignition system for dependable lighting and reliable operation. Dual Voltage Installation is simplified with voltage that adapts to either 110V or 220V. Universal Wiring Junction Boxes High and low voltage connections are easy and convenient with left and right side junction boxes. Digital LED Control Panel Electronic control/display maintains water temperature; monitors heater performance with self-diagnostic capability. Low NOx Emissions Environmentally responsible; complies with all current California and Texas air quality emission standards. A choice of left-side or right-side electric, gas and water connections gives Universal H-Series heaters unprecedented installation flexibility. This enhanced adaptability-coupled with lightweight design, modern low-profile appearance and only front-panel access required for installation and service-ensures compatibility with virtually all new or existing systems and equipment pad conditions. Although designed for budget-conscious applications, Hayward H-Series Millivolt heaters deliver uncompromising performance and economy. A standing pilot ignition system ensures reliable lighting, and-like all H-Series heaters-they feature a Finn Plate heat exchanger and Fire Tile combustion chamber. 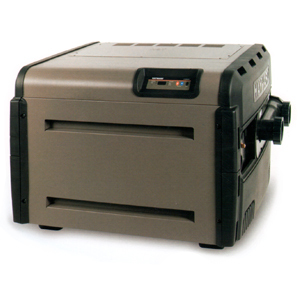 Available in your choice of propane or natural gas models, with input capacity from 150,000 to 250,000 BTU.